Stock Horse of Texas hosts stand-alone clinics, as well as shows paired with a one-day clinic. Our stand-alone clinics offer a small group setting that focuses on fundamentals as well as skills used in the four stock horse events. Some stand-alone clinics have live cattle for cow horse practice, while others utilize a flag. Shows paired with a one-day clinic are scheduled throughout the year. These events feature a clinic on Friday with four equine professionals each teaching one of the four stock horse disciplines (trail, pleasure, reining and cow). Riders are divided into four groups and rotate to each discipline throughout the day. Groups range from 15-20 riders per group. Riders will have the opportunity to practice on a live cow as well as ride across many of the trail course obstacles that will be included in the show on Saturday. Saturday shows run in multiple arenas throughout the day. A tentative show schedule will be posted online and on Facebook the day before the show, with estimated times and locations for each division. **Please note, the entry form is NOT a show schedule. 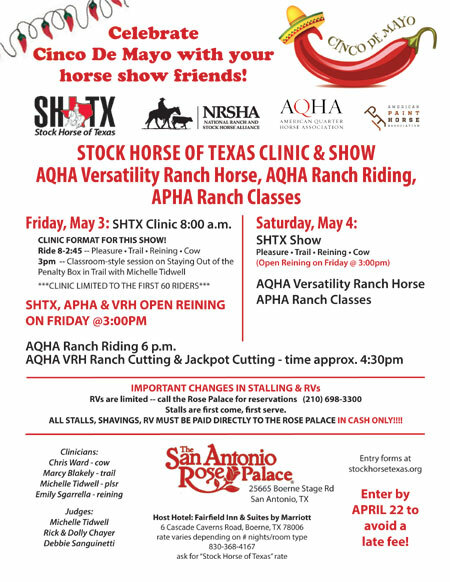 Some events offer co-approved AQHA classes. VRH World & NRSHA Championship! AQHA Heritage Center & Museum! 1. Register before the entry deadline! The deadlines are usually about 10 days before the show. You are welcome to sign up after the deadline, but please be aware there is a $25 late fee. 2. Please completely fill out your entry form. If we have to look up your address, registration numbers or membership numbers, we will charge a $25 incomplete fee. 3. If you have not shown this horse in 2016 or 2017 at one of our shows, please send a copy of your registration papers so we can add your horse to our data base. If you're showing AQHA, please send a copy of your membership card. 4. Not a SHTX member? If you're showing in a Stock Horse of Texas class, you'll need a membership. You can join online, or enter at the show. 5. Need to scratch? No problem as long as you let us know before the show starts. Please call or text our show secretary at 806-656-1511. 6. The show office is usually open Thursdays, 3-7pm. On Fridays, 7am to 8 pm. On Saturdays, 7am until the conclusion of the show. 7. Please try to check in the day before the show! It's faster and not as crowded. On show days, please check in when the office opens at 7am. We sometimes experience long lines on Saturday morning. 8. Got a question about our rules or divisions? Here's a few helpful links!